The name La toma de Quezaltepeque in Nahuatl means: "Mountain of Quetzales and beautiful city". Due to its volcanic soil the vegetation at the park is enormous and i home to many insectivorous plants. 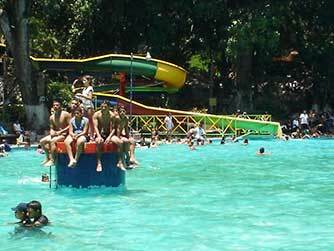 There are three pools (two for adults, one for children) and slides, an artificial lagoon where you can enjoy of a pedal boat ride, 48 cabins, four restaurants, picnic area, soccer fields, BKB court, parking for 250 vehicles, and police station. Located at 25 kms. North of San Salvador, at 425 m.a.s.l. If getting there by bus take route 109, from the east terminal in San Salvador.